Being productive and healthy at work can be tough and exhausting! 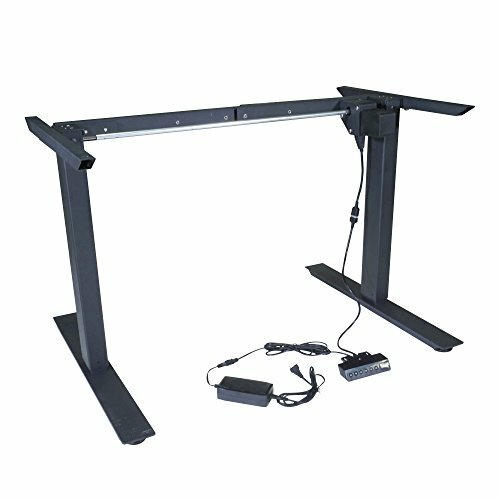 With our A2 electric adjustable desk frames, you can attach your own desktop surface and use the electric memory handset to adjust the height from 27" to 46" tall. The handset features 4 programmable memory settings and up/down manual adjustment buttons. Ultra-quiet electric motor will not disturb other people and is protected from overheating and overloading- power source required. The frame expands from 43" to 63" long, but make sure to measure your own desktop surface to ensure a proper fit. Desktop surface not included. We carry a full line of standing desks, standing desk frames, desk surfaces and desk risers to set on top of a regular desk, as well as a wide variety of fitness products. - Frame fits Titan Universal Desktops or your own desktop. - Lifting range: 27" - 46"
- Expandable desk frame length: 43" - 63"
Compatibility: This standing A2 series desk frame fits our A2 desk surfaces and others that meet the hole spacing requirement; Make sure to measure your own desk surface before purchasing!